Have you seen my previous post named Leaf Fan? Although, I was not intending to relate that post with the ceiling fans, it somehow is getting connected that way! Today, I found a very interesting website named Hansen Wholesale Ceiling Fans. Check it out! They have a huge variety of ceiling fans at wholesale prices. 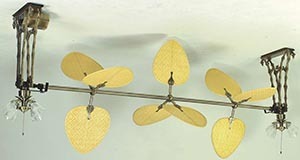 A kind of a leaf fan is on their Fanimation Palmetto Ceiling Fan Model FP601AB product page. The side photo is of that product. They have another very interesting page named Find out who makes the Best Ceiling Fans here!. It is a cool comparison to have a look at. Their product range includes Hunter ceiling fans, Minka Aire ceiling fans, Casablanca ceiling fans, Fanimation ceiling fans, Emerson ceiling fans, with many others. I have found many different types of ceiling fans on their website, and some of them are really new designs for me. Do have a look — Hansen Wholesale Ceiling Fans. I love these ceiling fans! They are as beautiful as the leaves! These fans are really cool and different. They would add a great look to any room. Love the way they are not like traditional fans and awesome if you wanted something a little different. These fans are really so nice and charming nature. I really like the fan that you have posted. It'll look beautiful if we put in on our home. And also using this fan can save electricity. When the weather turns cold, fans with reverse switches pull hot air up through the room and recirculate it to keep cool air from settling. A wide range of styles allow you to choose the fan that best complements your décor, and you can even choose one with a remote control that lets you adjust fan speed from the comfort of your couch or bed.